Personal Information: We ask for your first name, last name, an email address, and a password. This is your personal information which you will use to login. We don’t share this information with anyone. We may use the email address to get in contact with you if need be. Institutional Information: We ask for the name of your institution and an institutional email address. We present this address to users so that they may contact you with questions regarding institutional sponsorship. This doesn’t need to be your personal email address; it can be whatever address makes sense for your institution. Terms and Conditions: We ask that you agree to our terms of service. Please take the time to read through them and, once finished, check the box confirming that you agree to the terms. Immediately after creating your account, you will receive a confirmation email to the email address which you listed under “Personal Information”. No confirmation emails will be sent to the email address listed under “Institutional Information”. If you do not receive a confirmation email, please check your spam/trash folder. Read more: How do I change the person managing an institutional account? Scholastica institutional accounts require a credit card. You will need the card number, security code, and expiration date for the credit/debit card you wish to use to pay for your authors’ submissions to journals on Scholastica. Your card will be automatically billed every month for any author submissions during that time frame. Your card will not be charged if none of your authors submit during a given billing period. You can view your upcoming invoice, including a detailed breakdown of all upcoming charges, at any time by visiting your dashboard. Whenever your card is charged, you will receive a receipt by email. You can view past receipts at any time by visiting your "Receipts" page. 500 submissions: $2,925.00 Save $325.00! Pre-purchase a credit package and we will automatically deduct the appropriate number of credits whenever your authors submit a manuscript. Each credit counts for one submission to a law review (normally $6.50). Two credits will be deducted for submissions to non-law reviews (normally $10). Your card will only be charged when you purchase a credit package. Your card will never be charged automatically. When your credits are running low, we'll send you reminder emails prompting you to purchase additional credits. Enjoy discounted rates when purchasing the largest quantity credit package. How do I update the credit card for my institutional account? Can I create a separate account for students? How much do submissions cost? What size credit packages are available? Is there any way we can get a discount? Can I limit how much I pay per author? The author’s email address (e.g. jim@example.edu): You can add a comma-separated list of emails for authors you wish to subsidize. 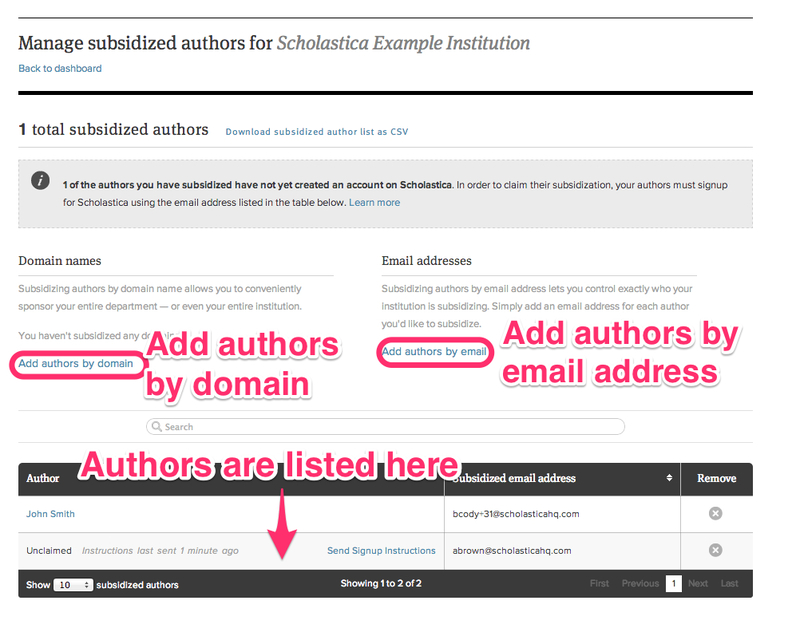 You will only be billed for the authors who sign up for Scholastica using the exact email address you specify. Just click "Manage subsidized authors" then "add authors by email". A domain name (e.g. example.edu): You will be billed for any authors who sign up for Scholastica using email addresses which contain the domains you specify. For example, “test.edu” would cover “alan@test.edu”, “sally@test.edu”, and so on. It would not cover similar domains (e.g. test.com) or subdomain (e.g. law.test.edu). It will only cover authors whose email address exactly match the domain you’ve provided. Listing a domain name is often the simpler solution, however, it's important to be cautious when using domain names. For example, adding 'your-institution.edu' will subsidize everyone in your entire school – including undergraduates and staff. If in doubt, we recommend listing each email address individually. How do my authors submit? Why wasn’t my subsidized user able to login? Can I submit articles on behalf of law faculty? How can I add an author to our institutional account who already has an account? Will authors be notified that they've been subsidized? What do my authors need to do in order to claim their institutional sponsorship? How long is the contract for subsidizing authors? How do I stop subsidizing authors? 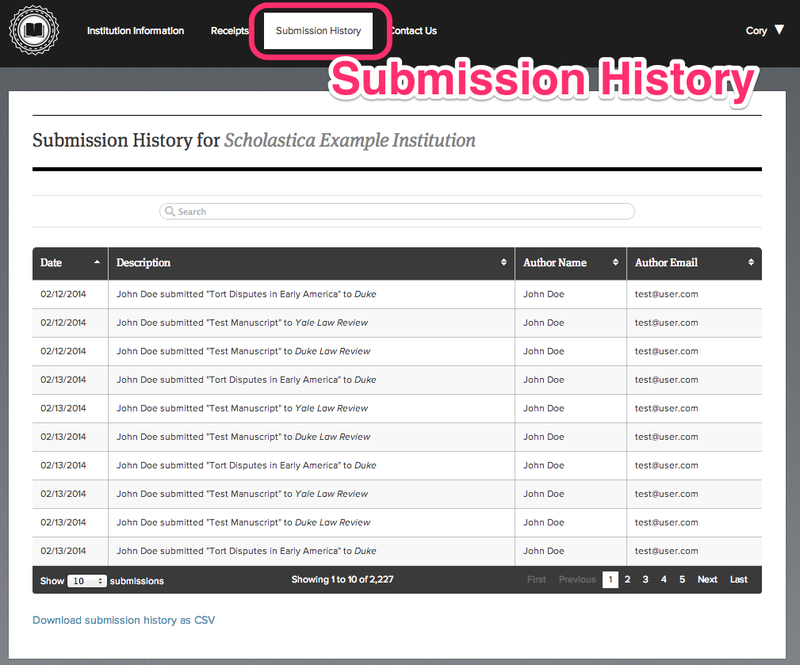 You can easily find a submission history of all of your subsidized authors by clicking the "Submission History" navigation link. If paying via automatic invoicing, the institutional contact will be emailed a receipt each month immediately after your account has been charged. If paying via pre-purchased credits, you will be emailed a receipt immediately after purchasing any credit package. In either case, you can view past receipts at any time by logging into your account, viewing the "Receipts" page, and clicking the view icon for a given receipt. Can I have receipts sent to a different email address? Will I receive any reminders when my credits run low?